In the IVF processes of our Laboratory nothing is left to chance. The critical steps that could lead to a possible confusion are absolutely identified, and we double check each one of them to guarantee that no errors are committed. But at Ginefiv we have decided to take one step further in the security guarantees we offer our patients. That is why we have incorporated IVF Patrol. IVF Patrol is an electronic security system that allows us to guarantee our patients –from the first consultation until the embryo transfer – a safe follow-up and identification of each of their samples. 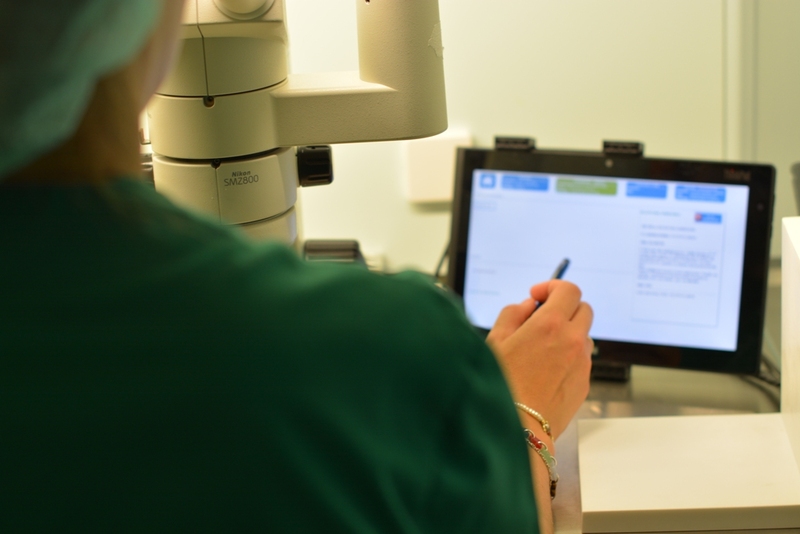 The patients’ data are linked to each of their samples (gametes or embryos) through a radiofrequency and electronic labelling system, allowing their permanent identity control at each point of the process. This way, the security of our processes of handling gametes is consolidated, avoiding any possibility of error or that two samples of different patients can coincide in the same work area. How does IVF Patrol work? Each patient is assigned with a single code card through RFID (Radio Frequency Identification) technology. This code will be read at each point of the process in which the patient or her samples are going to be treated (operating room, laboratory...). Throughout the treatment, all plates and tubes containing samples of the same patient will be identified with RFID self-adhesive labels with the same radiofrequency code, so that the patient’s identity can be verified in each phase of the treatment (egg retrieval, fertilization, embryo transfer...). If at a given time, the samples of different patients coincide in the same work areas, the system will warn the laboratory staff and the incidence will be registered. Are security errors at the laboratory something possible? Even if we have not had any cases so far, in developed countries such as Italy or the UK, there have been cases of gametes misidentification. Thanks to the radiofrequency system, there is a permanent control of the samples, and this means that they are always identified. This way, IVF Patrol allows a completely safe traceability during the whole treatment, offering an extraordinary security guarantee. What guarantees does the system offer? · It allows a follow-up of each patient and their samples, increasing their security. · Unambiguously identifies the patient, relying on something else apart from the name and surnames written on the tubes or plates. · It guarantees that the used sample will always be the sample provided by the patient. · Automatically registers any incidence or security breach. · It allows to control the workload of each biologist and reallocate resources to prevent possible errors due to an excess of workload. · It minimizes the number of laboratory duties in which a double check is necessary.